Actually, how far I went was a little over 13.1 miles, but I wanted something cute to start off with! Since Princess Weekend starts on a Thursday with the expo my friend and I took Friday off from work and drove the three hours to Orlando. We spent the afternoon at the expo in ESPN Wide World of Sports. It’s a lot of fun just kind of walking about and checking out all the great running and fitness stuff that on display, not to mention all of the official runDisney merchandise that, of course, I purchased. Now, Michelle and I weren’t running until Sunday and were fully aware that we didn’t really need to go up until Saturday for the expo and packet pickup, but we did anyway. Our job is stressful, we’re both annual passholders, and a day at Magic Kingdom is a cure-all. I’m not kidding. We spent most of Saturday at Magic Kingdom riding rides, dodging crowds, and stuffing our faces with delicious food- er, race fuel. Flat Ash with a Princess Anna/Frozen theme is ready! Saturday night was an early bedtime, of course. Anyone who has ever done a Disney race knows that while races start at 5:30ish, it’s best to be at the venue at least an hour in advance. My outfit was all set thanks to my Skirt Sports Lioness skirt and my friend JD over at Harpo Graphics. Princess starts at Epcot and since we weren’t staying on Disney property we left our hotel at about 3:30AM. Traffic is also pretty horrendous due to some construction, so we ended up getting to Epcot around 4:00AM. We hung out in the car before trekking into the welcome area. We’d had coffee at the hotel and bagels with peanut butter in the car, which is my go-to race day breakfast. I usually pair it with a banana, too. We knew the weather was going to be rough. Early that week there was an advisory about heat and humidity. As south Florida is our home and normal running place, we weren’t too worried. I did start hydrating with Nuun on Thursday and made sure to drink plenty of water all weekend. We had plenty of time to take pictures and visit the porta potties and nothing felt rushed at all. I guess that’s a perk of waking up at 2:30 in the morning! Once we made it to the corral there was a lot of waiting. My friend and I are not fast runners, so we were in one of the last corrals that also happened to be a very large group. There were about 25,000 runners on Sunday morning, so it was packed! If you read my post about training fail then you know I was not at all prepared for this race! I signed up last summer with the intent of training and things just did not work out for me. I won’t make excuses because it was all me, for sure. The thought of “faking” a half marathon was pretty daunting but we were ready to run, walk, and have a little bit of fun. The weather was nice for the first few miles…until the sun came up. We had a smooth first half and the sun was coming up just as we were entering Magic Kingdom. 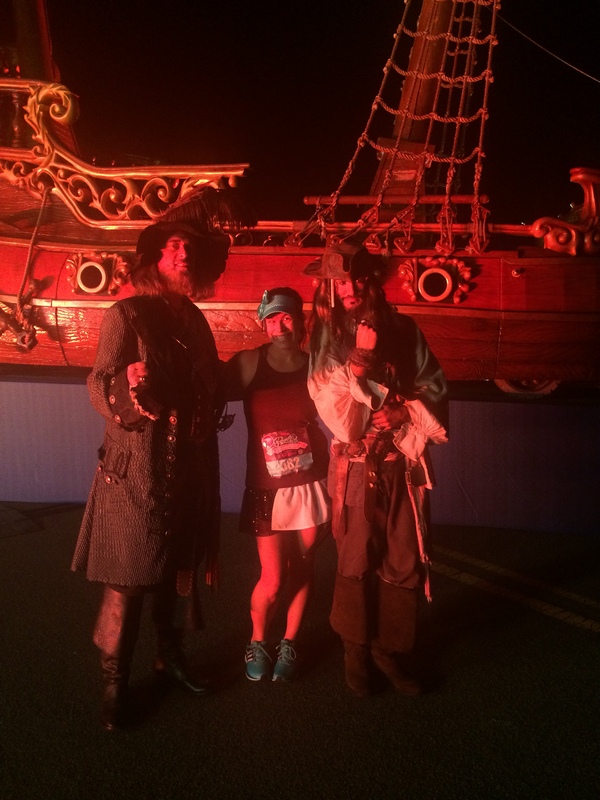 One of the greatest things about a Disney race is the characters on the course. There are, in true Disney fashion, always long lines. Don’t worry. You can just take selfies. 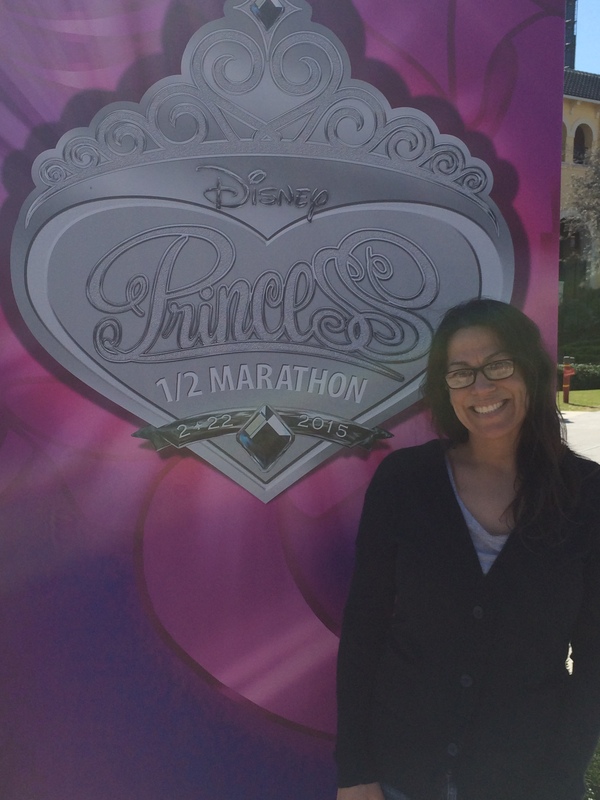 My Princes await…but so does the finish line. Now, the sunrise is Disney is great, don’t get me wrong. It’s the heat that comes with the sun at miles 7-10 that were killer! About mile 8 my legs started to get heavy and I was doing more walking than running. Thank goodness Michelle was there to push me (as always). I had a Gingerade GU to try and perk me up as I was starting to feel hungry, too. 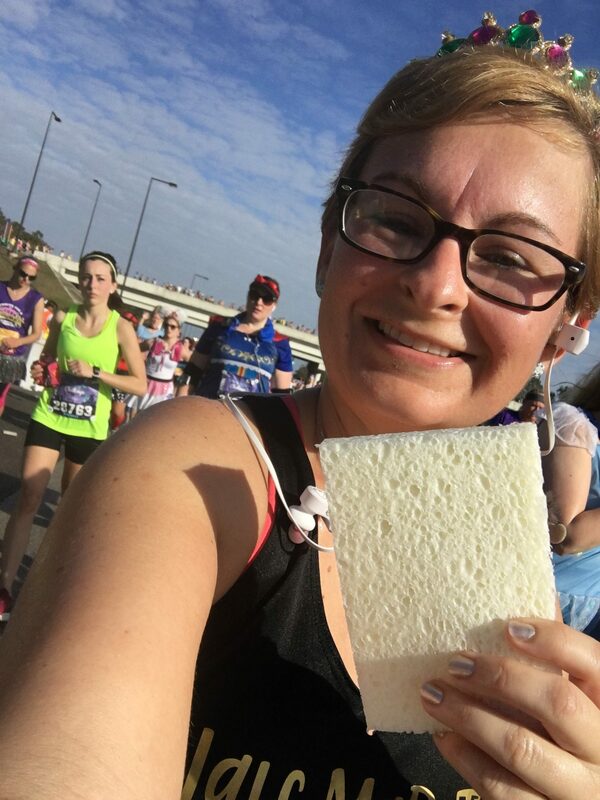 Volunteers were handing out sponges to help runners stay cool. Mile 10 started with a fairly intense cramp that I couldn’t seem to shake. We were making decent time for a not setting an actual pace and doing some walking, so we took it easy for a little while. The crowd was still pretty thick around us and once we hit an overpass you could still see a sea of runners behind us. It sounds mean, but as a “back of the pack” runner I’m always glad when people are behind me! Coming into Epcot means coming up on the finish, so Spaceship Earth was a lovely sight! Always be on the lookout for Disney photographers for your fun pics! I love running through the parks and seeing all of the people there. Even if they are actually there cheering for you, they are still cheering! Unless they are just park goers who had no idea there was a race. Then they are just looking at you being all sweaty and weird. Running is such a fun sport because there are so many different levels of it, but everyone is still very encouraging. 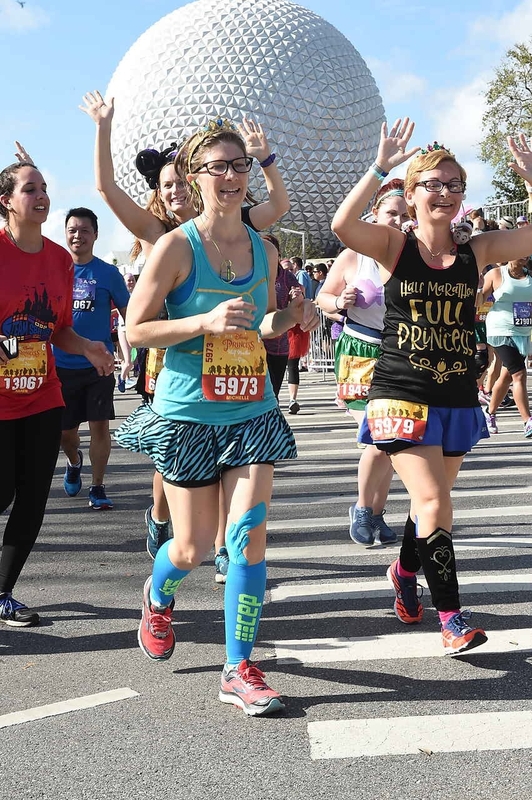 One of my favorite things about Disney races is seeing everyone’s running outfits and just the joy (really) of running through Disney. When no one gives you high fives, you smile anyway. I made sure to high five the choir for Meridith (no pics, sorry) and that is how you know you’re in the home stretch! Rounding the final corner to the finish line is exhilarating and exhausting. I almost tried to stop, but Michelle pulled me through and we finished at a little over three hours. Our goal is to do a sub three one day, but this was not the race for that. Once we stopped moving I felt a little queasy. 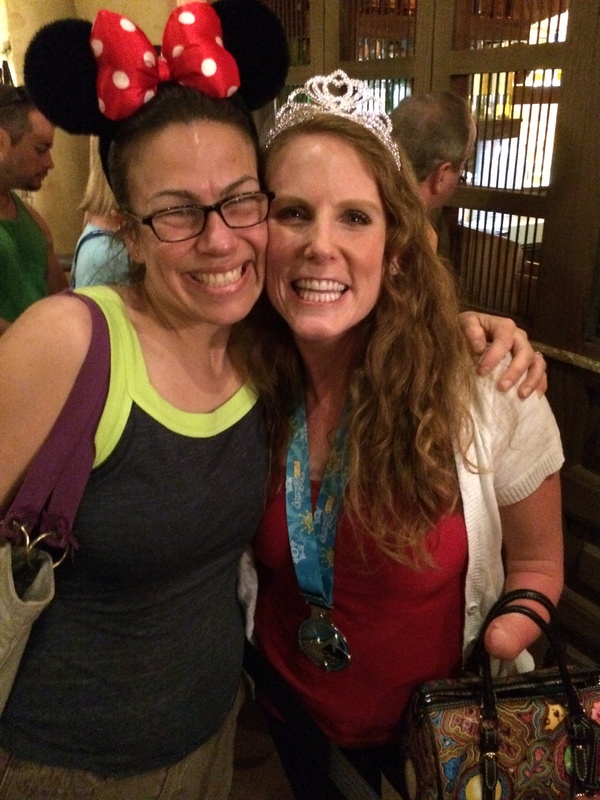 It was nothing a runDisney snack box and some ice didn’t fix. The race was as tough as I expected it would be. My legs were screaming at me afterward as we headed to Disney Springs to eat all the food and then head home. It was a great weekend of fun, even the running part of it. 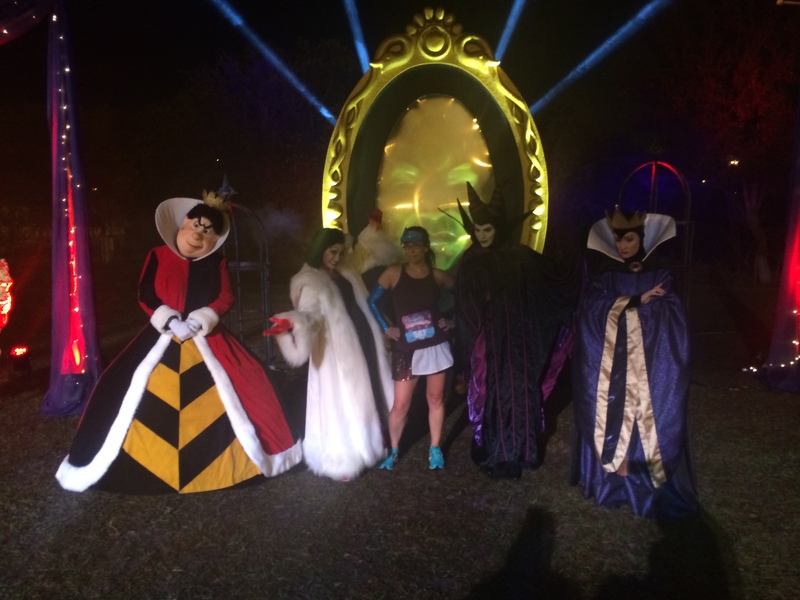 I will always recommend a Disney race to people just because it’s such a huge event and it’s always a lot of fun. Even if you don’t train for it. Always get the castle pic. 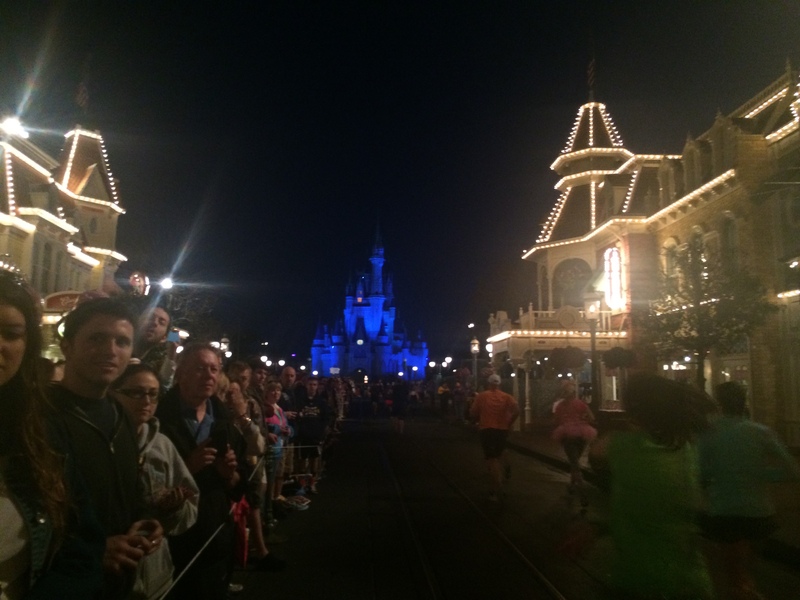 A week ago today, I was headed south to run through Walt Disney World with 24,000 other runners. I ditched my car in a snowbank in the airport’s economy lot and ran from the -6 degree weather all the way to sunny Florida. 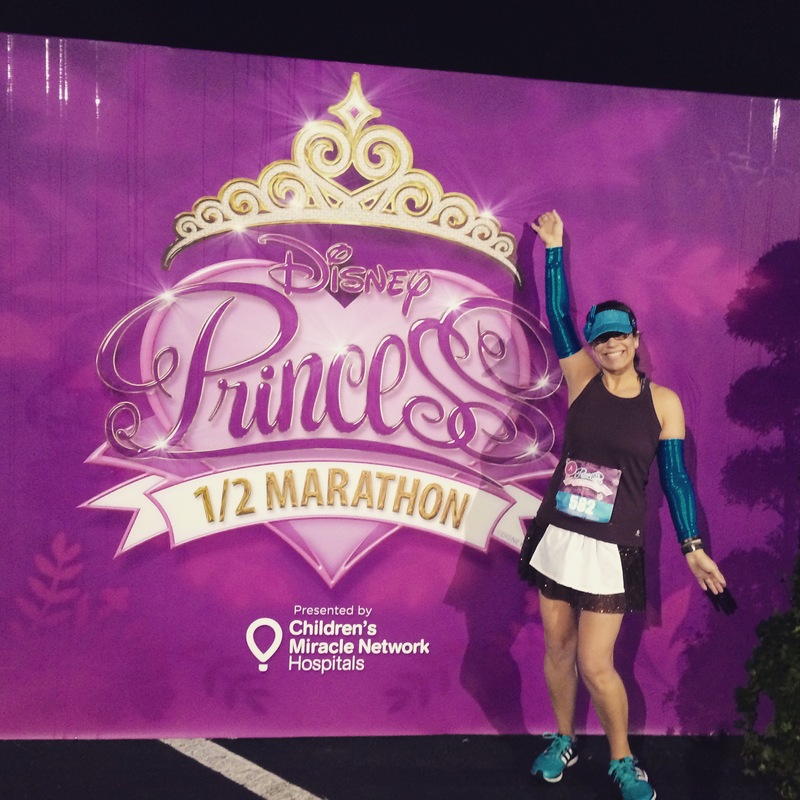 For the third time in four years, I was running Disney’s Princess Half Marathon. 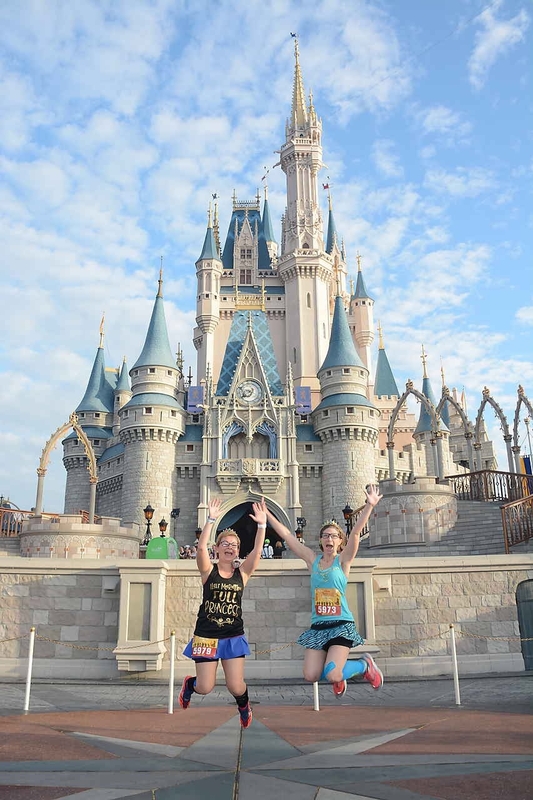 This race is special for many reasons – I ran it with Meri (and Brooke) in 2012 as Meri completed her first-ever 13.1, I get to spend time with so many friends, and (duh) Disney. But most importantly, I love that the entire weekend is a celebration of women, for women. 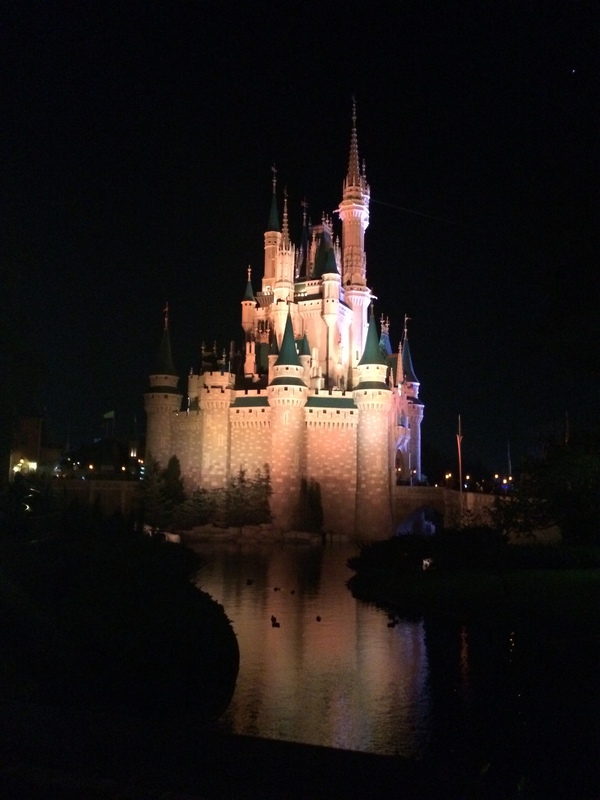 I packed much into my weekend with an impromptu solo trip to Magic Kingdom on Friday, (BRR!) 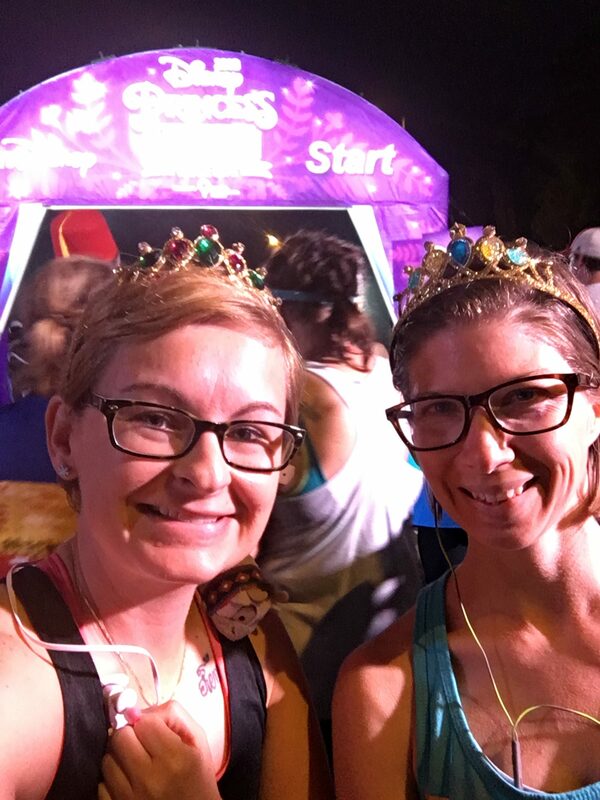 a day at the expo working the Sparkle Athletic booth and the race, followed by an evening romping through EPCOT and quite possibly the most perfect ride on the new Seven Dwarfs Mine Train – seriously, there was a 20-minute line and we rode to fireworks! A new display lit up the sky as we rounded nearly every turn. But more than anything I loved seeing my wonderful women. You all know who you are! 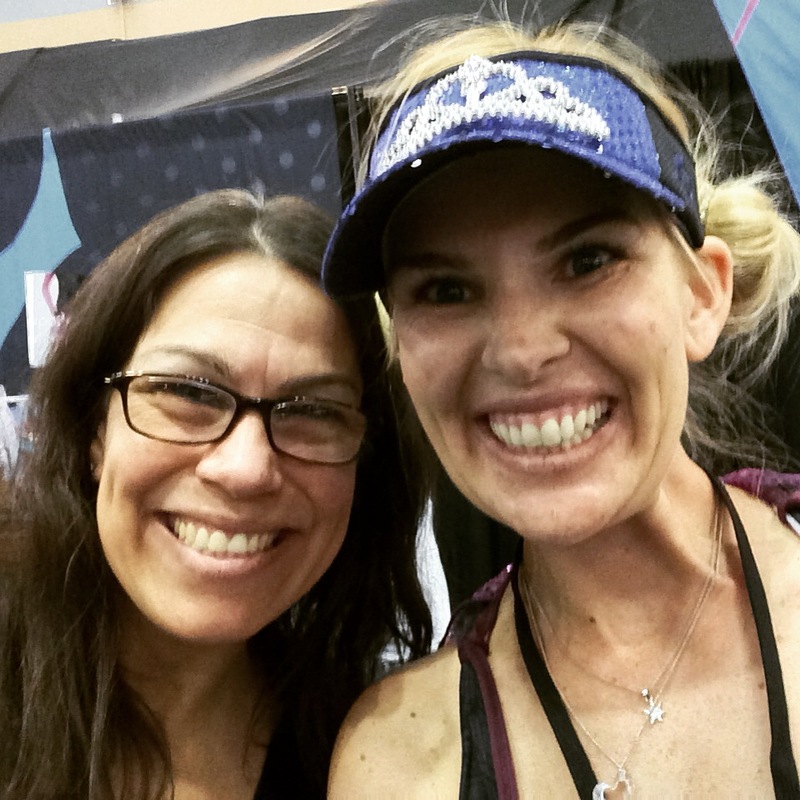 Visiting with Kelly at the Sparkle Athletic booth. Thanks to all who popped by to visit me on Saturday! You know I did. 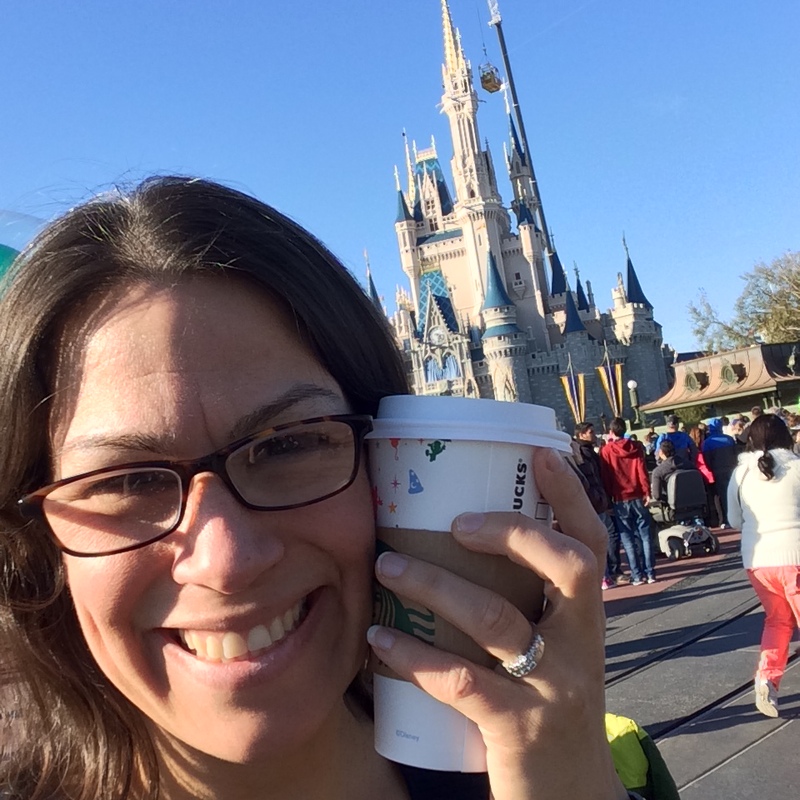 Sadly, all Disney-themed Starbucks mugs were sold out. 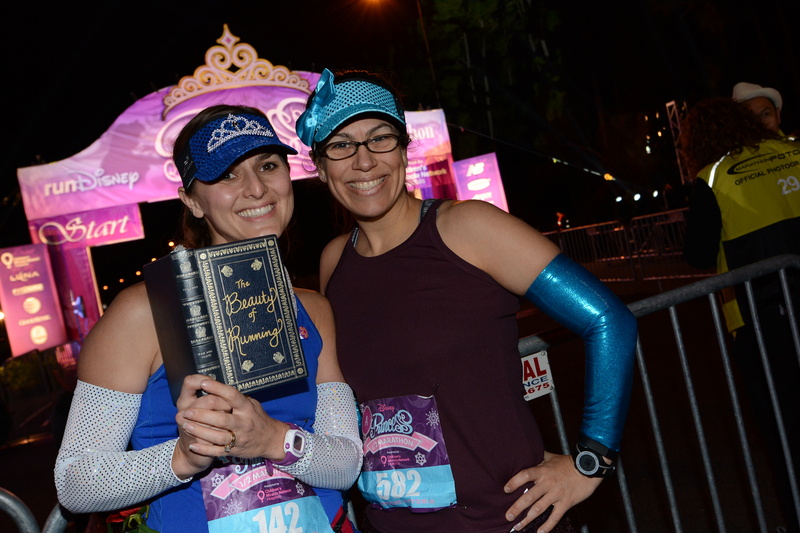 Bookish Belle (Carrie) and Servant Cinderella at the race start! 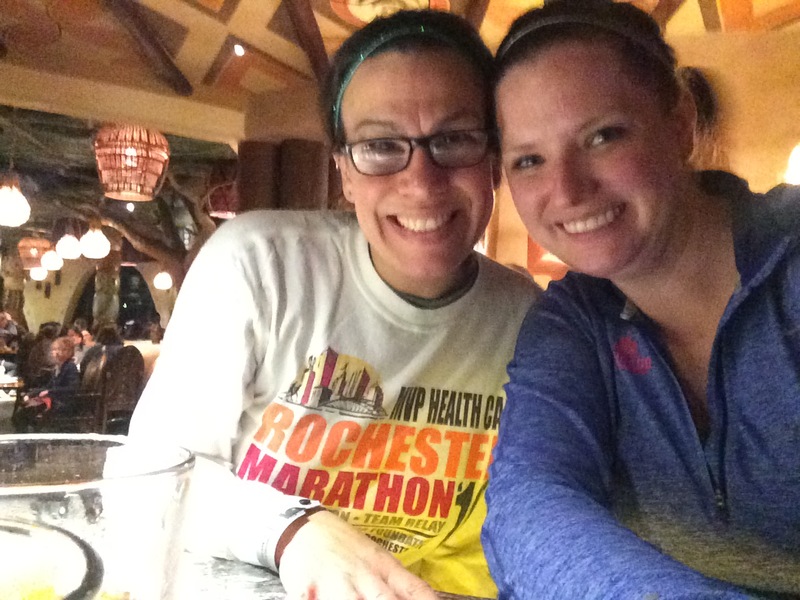 Moments after this was taken we learned news of the newest runDisney event – half marathon weekend at Disneyland Paris in Sept. 2016. 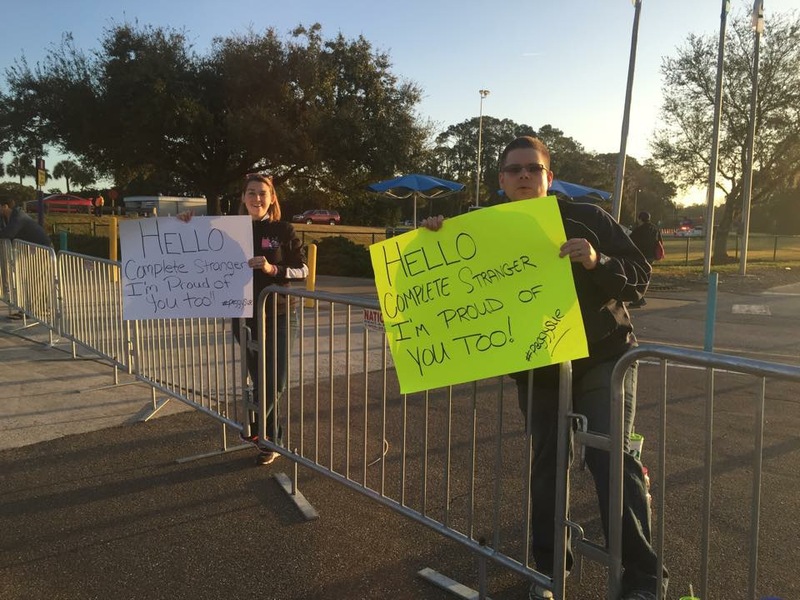 Just after mile 12, I fought back tears as I saw these signs. 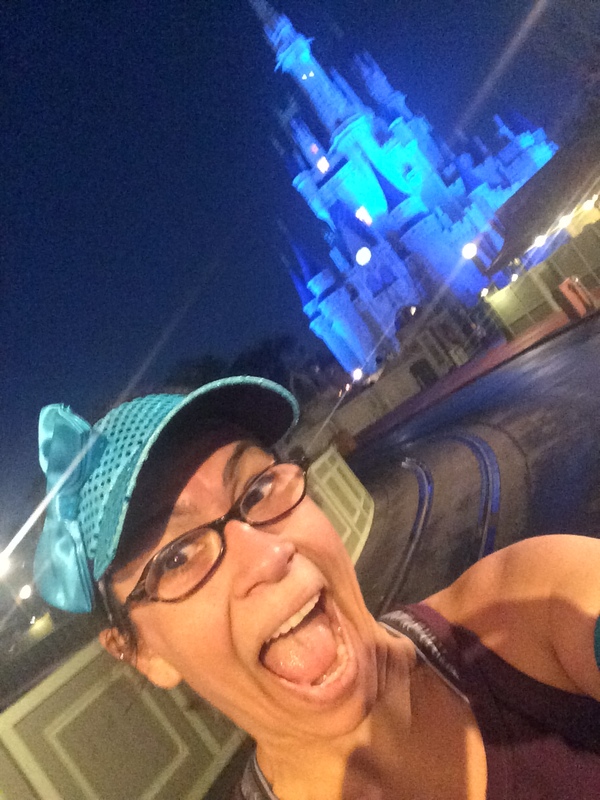 This was the first runDisney race I ran without seeing Peggy Sue and her iconic sign. She passed away last month. I spotted what appeared to be her sign held by who I believed to be her family. It was so moving – and took me longer than I expected to control my emotions – and breathing – for the next minutes. We love you Peggy Sue. 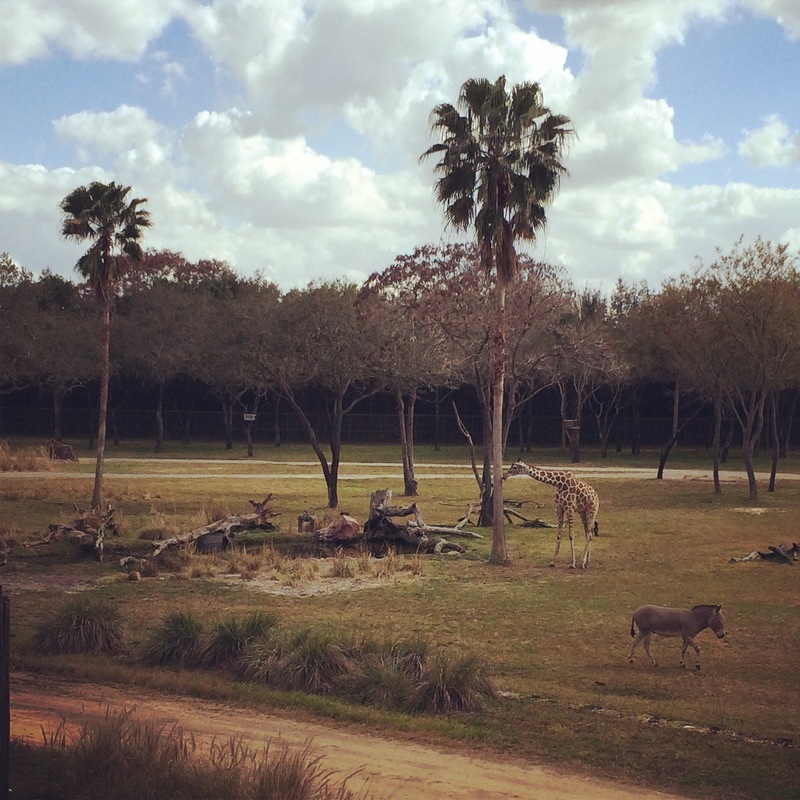 For the second straight year, I stayed at the Animal Kingdom Lodge. I love this place and it’s incredible views of the animals and hospitality. Til next time! 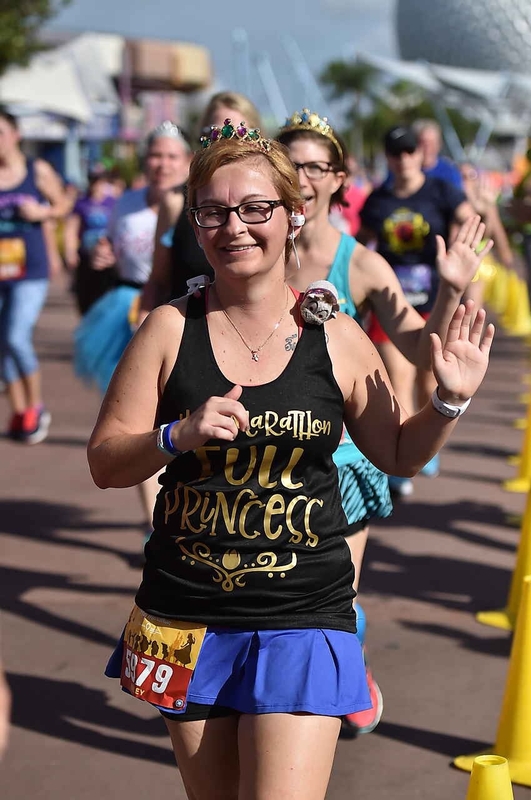 What was your favorite part of Princess half weekend? Do you ever hit the parks alone? What was your race strategy? One week from today, I’m heading to the Happiest Place on Earth! That’s right, in seven short days, I’ll be reunited with several good friends in Orlando as we celebrate Princess Half weekend at Walt Disney World. I’ll be honest, I need this respite from rough wintry weather. As I write this, it’s 4 degrees below zero outside. And I haven’t even factored in the wind chill (-15, for the record.) But enough about the weather. Let’s talk about all things girly and warm! 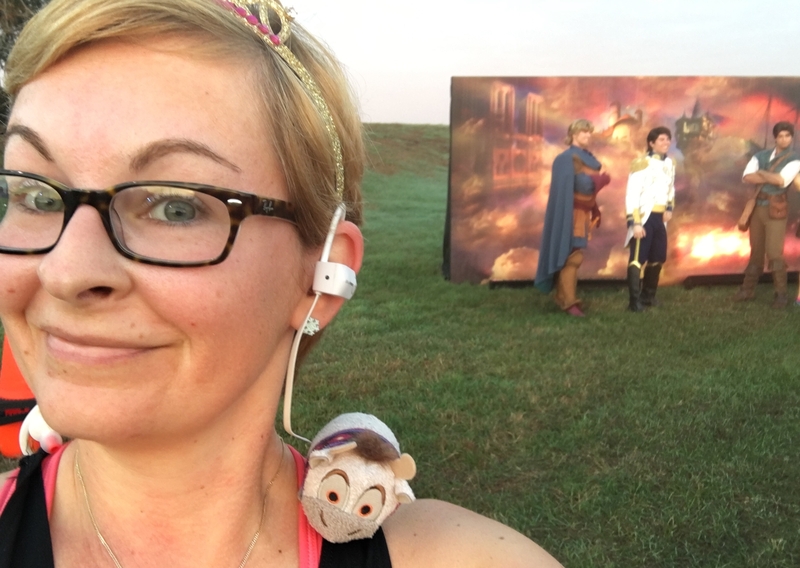 Princess Half Marathon and Tangled 5K were my first runDisney race in February 2012 as Brooke and I ran with Meri as she tackled her first-ever 13.1. We all loved the experience, but learned a few things in the process. 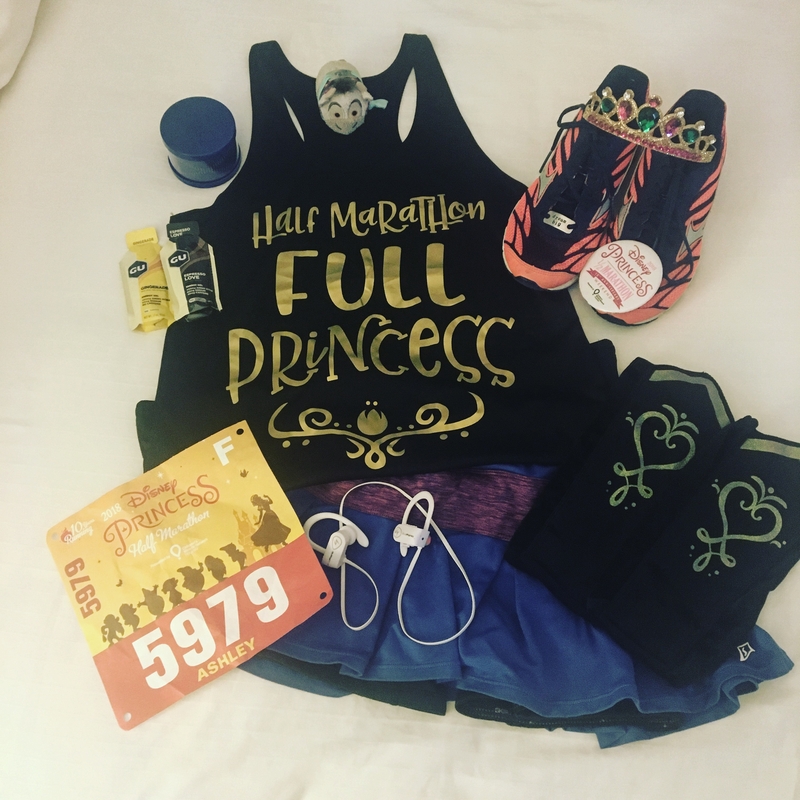 How and where do I get my race packet (and shirts)? The expo also features a Speaker Series that includes seminars on training, racing, how to deal with Florida’s heat and humidity and nutrition. This is pretty fantastic and filled with LOTS of great info. Some times will be busier than others at the expo. If you want a Dooney and Bourke Princess themed purse, go Thursday morning as these babies will sell out quickly. If you want to avoid as much shopping temptation as possible, go on Saturday afternoon as a lot of items will be sold out by then. Don’t see a sign? 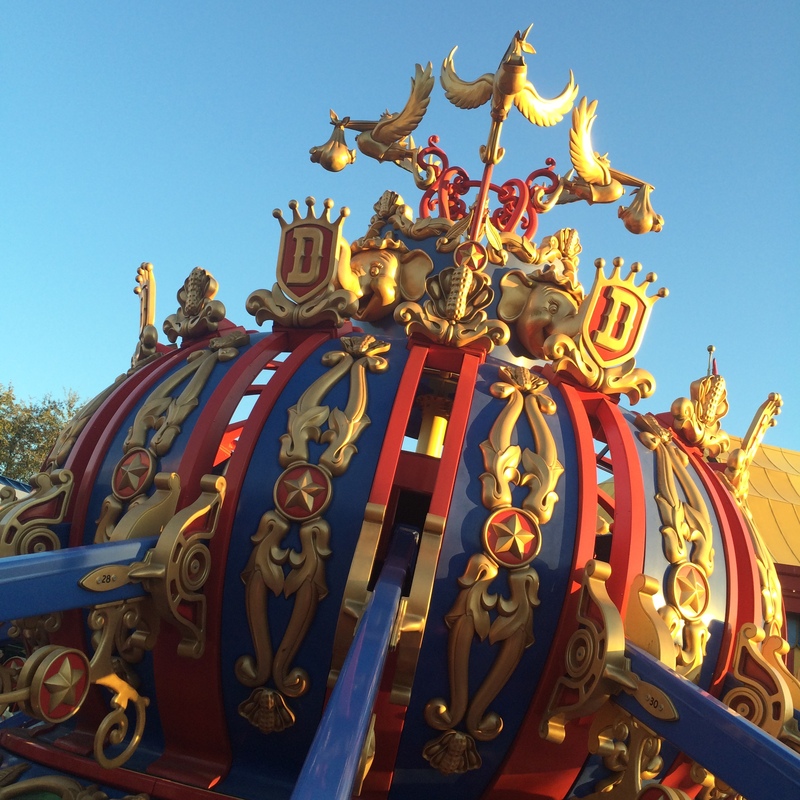 Ask a cast member or ask at the front desk and they will direct you to the appropriate location. If you are driving to the expo, parking is free at the Wide World of Sports. Can I change my corral at the expo? Sadly no. Until 2013, runners could switch corrals if they provided proper proof of time. Race morning: What’s the drill? Personally, I get up insanely early to hop the first-possible bus out of my resort. It’s absolutely worth rising a few minutes ahead of an already nutso wake-up call, to arrive early at the starting area. This gives you enough time check your bag, hit the bathroom and walk 20 minutes (in a crowd) to the starting corrals. Then, be prepared to wait. Depending on how early you get to the starting corrals, you may have a wait until the 5:30 am race start. Also, it’s a good idea to know WHERE you are going to be catching the bus. I tend to the bus stop to check it out the day before the race. What should I bring race morning? Bring a garbage bag (to sit on) or an old mylar blanket from a previous race. If the forecast calls for a chilly race morning, bring a throwaway shirt or sweatshirt and if its cold enough, gloves. You can toss all of these items over the corral fence and to the side once you start running. And obviously, bring your pre-race fuel, such as a banana, bagel or packaged treat. I also always bring a package of tissues….just in case I head into a portable toilet without any toilet paper or need to make a pit-stop in the woods. Once you start running your 5k, 10k, or half-marathon, enjoy your experience! Snap lots of photos as he run and please be courteous to your fellow runners! Til next week, I’ll be packing and hydrating….and repeatedly checking the forecast. Have a great Princess weekend everyone! Brooke and Meri celebrate at the finish in 2012.